Emerging Conservation Steward winners must have implemented conservation practices for three years or less and addressed at least three resource concerns. 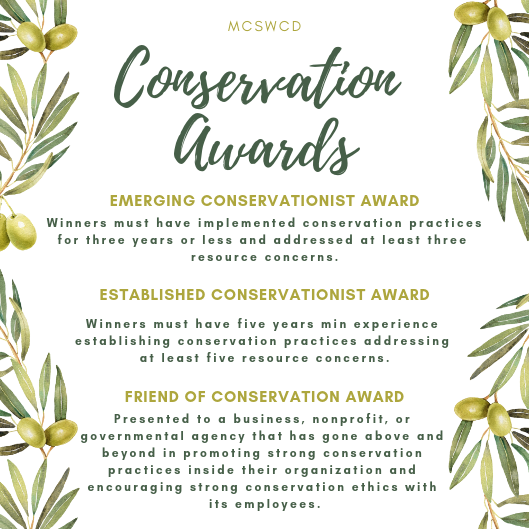 The Friend of Conservation Award is presented to a business, nonprofit, or governmental agency that has gone above and beyond in promoting strong conservation practices inside their organization and encouraging strong conservation ethics with its employees. ​Established Conservation Steward winners must have five years min experience establishing conservation practices addressing at least five resource concerns. 2019 Award Nominations Open Now! The Monroe County Soil & Water Conservation District selects three Conservation Award winners per year at the SWCD Annual Meeting to recognize local conservationists. ​To nominate an individual or organization: Fill out a form below and send it to Martha Miller at monroecsoil@gmail.com or, send and email with the name of the individual/organization, which award they are being nominated for, and why they should be considered for the award (2 paragraphs maximum). Nominations must be sent by February 8, 2020. Part of the journey to create the mobile application Mark-it was the volunteer hours of the Serve IT team that created the final product. This group of young people went above and beyond their normal academic course load, personal activities, and social lives to volunteer their time to learn about working with “real-life” customers. It was because of these young people and the Serve IT team that Mark-it is now a reality and usable application. Congratulations to Monroe County SWCD and IU Serve IT. ​Mark-it is now live! Check it out!